This question and many others like it are factually resolved in the book, Forty-Two Months and Ten Toes! This book will be an enlightening experience for New Christians; Bible study groups looking for answers; and Jewish Shabbat discussions, because it exposes various mis-translations that are "Church compliant," but also contradictory. The book also correctly translates these various Greek Texts so they are correctly compliant with Jewish Customs, the Jewish Festivals and their accompanying Jewish Rituals and Lunar High Sabbaths (i.e. Feast Days). 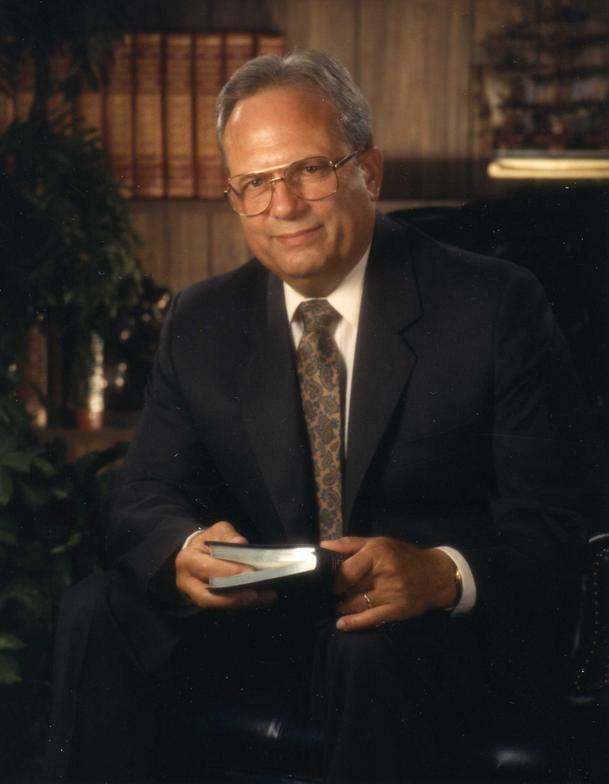 Westerly began writing Forty-Two Months to explain how the days during the "Crucifixion" Passover-Week precisely coincided with the days during the "Exodus" Passover-Week. But he found the Jewish Festivals and their Sabbaths (i.e. the Feasts of the LORD) were complex and not easily understood. So, he wrote a fact-filled, semi-fictional novel, wherein the characters in the story dialogue about the Jewish Festival Rituals, while Yeshua (i.e. Jesus), is factually fulfilling them. "Not only is this book a great page turning read, it is also a great reference volume on the Jewish Faith and the Jewish Feasts and Festivals. 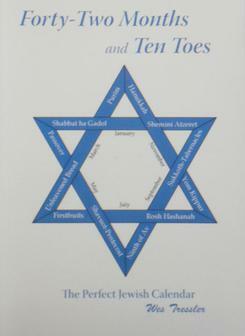 The footnoting and appendices provide a wealth of knowledge on the Jewish Faith! Anyone seeking to learn about Judaism should read this book." Discover how the Orthodox Jewish Calendar and Jewish Festivals proclaimed the days and years of Jesus' Birth, Piercings, Resurrection and Ascension. 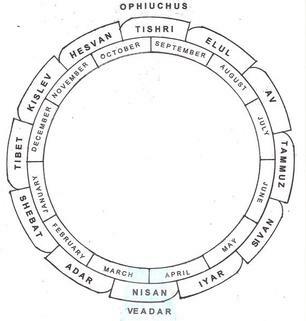 This diagram is a juxtaposition of the Jewish calendar months with the Gregorian calendar months. According to church tradition, Jesus (Yeshua) died on Friday and arose on Sunday Morning. If so, how did Jesus remain in the grave for 3 days and 3 nights? Did Jesus lie in Matthew 12:40? These dates are revealed in the Gospel of St. Luke. failed to check out the ORIGINAL Greek Texts of the four Gospels!!!??? may be ordered from your local bookstore or from Amazon for $14.99. ​All other editions may be over- priced, and are not the final book. Experience the Passion Week in a manner only those who followed Jesus through the Passion Week would have witnessed. Acquire an insight into how the Original Greek Texts and Jewish Festivals repudiate academic claims that contradictions exist within and between the Gospel Accounts. Find out why Prophecies for the End-of-the-Age will likely occur at the Appointed Times alluded to in the Four Festivals yet to be fulfilled. Jews are required to observe 9-Lunar High Sabbaths + 52-7thDay Sabbaths each year. The Passover always occurs during Aries the Ram, and Sukkoth always occurs during Ophiuchus the Serpent. According to Rabbinical Tradition, the three major Jewish Festivals depict the Appointed Times for the three harvest Seasons in Israel. But the Torah calls them the "Appointed Seasons of the LORD! Forty-Two Months will be an enlightening experience for Observant Jews with questions; and those attending afternoon Sabbath Day discussions to look for answers. The book uses the Torah itself to clarify what many assume to be un-explainable texts in the Tanach, (i.e. the Jewish Old Testament). Why does the Bible seem to contain some contradictions? Does "ISIL" include all Ten Toes on the statue-image in Nebuchadnezzar's dream? Forty-Two Months and Ten Toes, is an intriguing,1st-Century love-story flourishing amid a perplexing backdrop of the Piercings and Resurrection of Jesus. Forty-Two Months and Ten Toes, is an intriguing 1st-Century love-story that juxtaposes the Jewish Passover and its rituals along side of the Gospel Story as told by the Church. The stories are similar, but the real story is a kosher one.